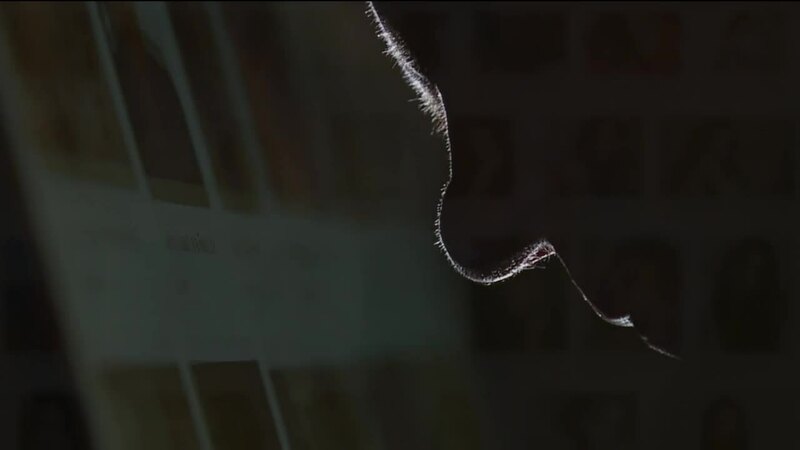 A WEWS investigation reveals how online romance scammers swindle people looking for love into giving away thousands of dollars to strangers they’ve never met. The number of so-called “sweetheart scams” has skyrocketed as more people turn to online dating websites, apps and social media to meet their soulmates as law enforcement struggle to find the resources to bring them to justice. About six months after Ann met someone going by the name “Bradley Hall” through an online dating website, he asked for money. For $600, he said he could return home early from Iraq, where he was serving in the U.S. Air Force, so they could start their lives together. She sent him the money. Then, she sent more. Ann eventually wired him a total of $40,000, including cash she obtained through a home equity loan. A few years earlier, friends had encouraged Ann to look for love online. Ann signed up for OkCupid, a popular dating website. 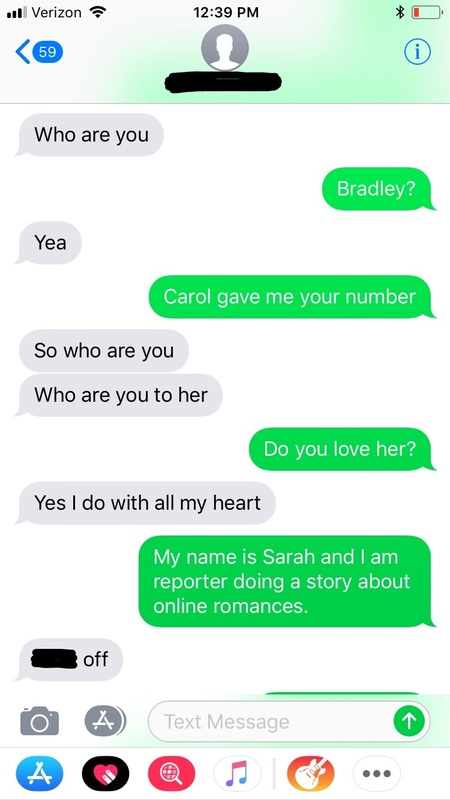 Soon, she connected with the man who said his name was Bradley Hall. From the beginning, he made big promises. The divorced Ohio grandmother feels so ashamed she fell for an online romance scam she declined to share her real name for this report. Our team found stories like Ann’s have become increasingly common in the U.S.
· In 2018, 16,794 people were victims of confidence or romance scams between Jan. 1 and Nov. 27. · In 2016, 14,546 people reported confidence or romance scams to the FBI. In 2014, only 5,791 people filed complaints about these types of schemes. Even more troubling, Anderson said the number of complaints fails to capture the scope of the problem. “It doesn’t touch it, I don’t think,” she said. She said many victims feel too ashamed and embarrassed to come forward to report the crime. Lucy is not one of those victims. She notified the online dating website she used and filed federal complaints. “I just want other people to be aware of the scamming,” Lucy said. However, like Ann, Lucy is embarrassed she was swindled. WEWS agreed to change her name to interview her for this report. In the meantime, four years after she met the man who scammed her, she is still working to pay off credit card debt she accrued from her short-lived romance. Lucy had waited a year after her divorce to start looking for love. At her friends’ recommendations, the 50-year-old single mother of two signed up for Match.com. Almost immediately, a man calling himself “William Rizzo” messaged her. He told her he was from the Akron, Ohio, area, but was currently working as a construction engineer in South Africa. He also said he was a single parent who wanted to build a new family. “It was just all different kind of nonsense to try to get into a woman’s heart,” the Ohio woman said. Just days after they connected, he claimed his wallet was stolen and he didn’t have money to feed his young son. She wavered, but still sent money. Days later, Rizzo had another emergency. 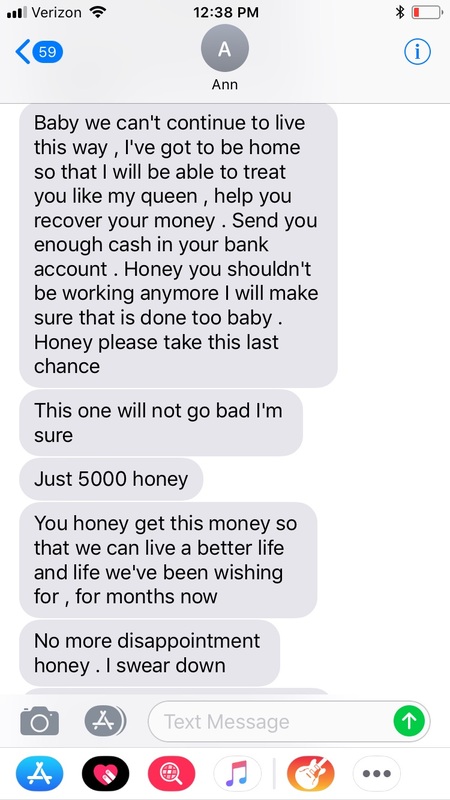 Again, she sent money. Soon, she had maxed out her credit cards, sending more than $7,000, much of it wired through Western Union. When Lucy told Rizzo she was out of money, his text messages, describing her as “gorgeous,” turned from nice to nasty. Unlike most victims, Lucy may recoup some of her losses. She sent most of the money through Western Union and saved her receipts. In 2017, the U.S. Department of Justice sued the company for allowing scammers to use their service to transfer funds. Western Union settled for $586 million . “There’s always some story where they need money,” said Alex Hamerstone, a professional hacker, who currently works as the governance, risk management and compliance lead for Trusted Sec, a security consulting firm. It's scammers' targets that vary, he said. WEWS also reviewed a sample of romance scam complaints made to the Federal Trade Commission over three years. Most of the victims were under 60 years old. “Sometimes we think of younger people being more technically savvy, but they’re also much more trusting online,” Hamerstone said. Hamerstone said romance scammers also target men. “All of a sudden, they’ll get matched online with some young, beautiful woman and they’ll assume they’ve hit the jackpot and then they get strung along and they end up out of a lot of money,” he said. What’s being done to stop online romance scams? 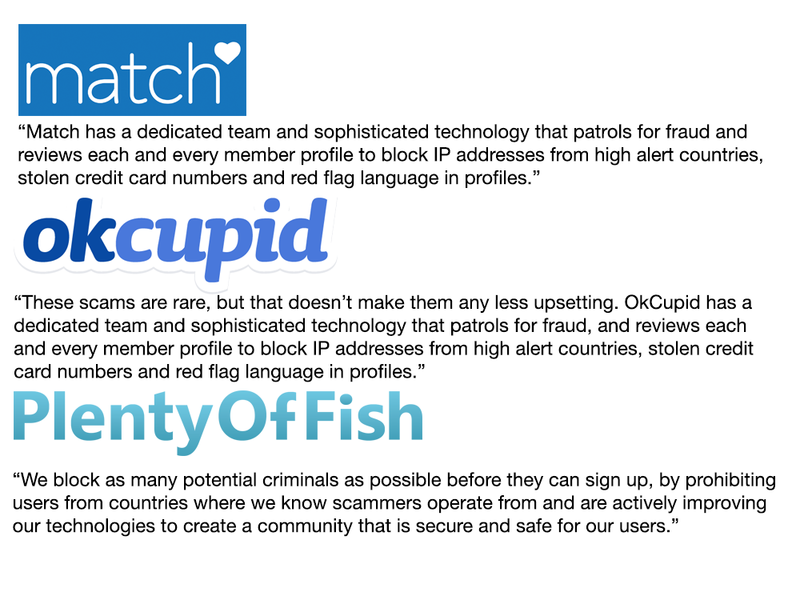 WEWS reached out to popular dating websites, including Match.com, OkCupid and Plenty of Fish to ask how they protect users. None of the organizations would answer specific questions or agree to an on-camera interview. Instead, they sent us statements. You can read them in full here . </p><p>Anderson said online romance scams often provide a unique challenge for law enforcement officials. “It’s not some individual sitting in a basement,” she said. “We have several schemes that are coming from various countries. The FBI found many romance scammers operate from Canada, England, Ghana and Nigeria. "We don't have the authority to just go over and arrest somebody in another country,” she said. As result, there are few cases brought to justice. In 2018, WEWS found only three cases filed in federal court, including one in the Southern District Court of Ohio. Prosecutors alleged eight people laundered money from romance scams on popular dating websites, including Christian Mingle, BabyBoomerPeopleMeet.com, PlentyofFish.com, OurTime.com, eharmony and Facebook. After all, she can provide the phone number Hall currently uses to investigators. She knows it works because she still communicates with the man who conned her out of $40,000. </p><p>WEWS texted the Chicago-area number, but the conversation with Hall didn’t last long. So why does Ann still communicates with Hall? “I guess it’s the still the words he says,” she said. “Even though I don’t believe a word of them, it’s still good to hear. In the meantime, she’s gone back to work to supplement her social security and earn back some of the $40,000 he took from her. “I feel I failed everything,” she said. “It’s just awful to think that I saved, I don’t know how many years, for that money, and it’s gone,” she said. 1. Don’t send money to someone you have only met online. Just don’t. 2. Do a background check. Use Google. Search for their photo on other websites. Go the County Clerk of Court’s website where they live to look for civil and criminal charges. 3. Do talk to trusted friends. Get their opinions on your new admirer. 4. Do take it slow. Be skeptical of someone who immediately professes love for you. 5. Do be skeptical. If your new love interest won’t talk on the phone, video chat, or meet you in person, those are serious red flags they may be a “sweetheart swindler."